After that find a trailer someone else made and base yours on that - maybe the pace and flow of the wording, intro and outro and maybe the odd nice touch (like a subscribe animation). For me, the Michelle Phan trailer was just perfect at 29 secs with 81 words (spoken in 23 secs). That's 3.5 words per second - this is invaluable to know and will help you later on. If you listen to Michelle's and my own, you ill see we Intro, say our name and then use the think of it as.. The failed photo shoot. After getting all excited I had a good idea (based on making video in a small woodland, with labels pinned to trees shot with a blue screen and voiced over by me, I realised life happens when you make other plans. It was 33 degrees in the woodland, mosquitoes were quite happy to take chunks out of my legs while I was there for two and a half hours - and stupidly I forgot to take a bottle of water. So when I left I was nearly passing out in the midday sun. The six videos and 50 photos were fine - just totally irrelevant for the trailer. I placed a blue A1 size card at strategic places, took a photo with idea to chroma key out the blue and replace with a video or slide from one of my previous videos. After weeping for a few hours - it's always hard to let go creatively, I decided to forget those photos (for now) and concentrate on a simple voice script. The photo above is a decent enough, just as you will see, does not fit into the finished piece. However, the woodland visit was not a total disaster as I imagined talking to visitors coming through the gate and Welcoming them to my channel (the channel being the woodland). Which in a kind of weird way reminded me of the time I taught photography at Summer Camp in North Carolina. I had to stand in front of 325 staff counsellors and welcome them to my photography programme, tell them what to expect and how it would benefit their children. I needed 80-90 words that were as natural as possible. using a gel pen and a lined pad, I wrote one page, rewrote it three times and read it aloud as much as I could. Using the Zoom H1 mic I recorded six takes and a few short clips. I decided take six was as good as it will get without driving myself insane and wasting endless hours.. It came out at 85 words plus the 14 words at the end (saying how I am verified). I debated for a long time if that was needed at all. I decided it was, as I'm asked by youtubers so much why I have that tick (while not having many subscribers). If you want the answer, it's in my youtube about area. You can see those 100 words as the lead slide to this post. I spend a lot of my time in the countryside to take photos. I'm always alone and when I meet a butterfly, tawny owl, baby kestrel squirrel, fallow deer or a fox - I always greet them in the same way, Oh hello.. So that's where the oh hello on my trailer comes from - instantly grounds me to the country and the wildlife. [in this sage of people living in cities, being alone in the country and being 1:1 with nature is something many will not ever experience.. a while ago I was watching baby fox versus baby deer - neither knew what they were supposed to be doing. predator/prey, running chasing or just being friends] ..
What I'd always planned, to open with a black side and end with a white one (with another given as the subscribe slide). 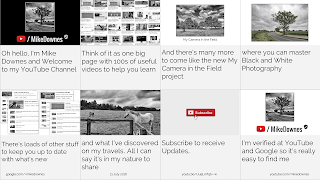 Next I added the My Camera in the Field slide, made three screenshots of my channel videos, edit as black and white. I thought the tree photo matched as that is already seen at start and end of video. To illustrate the 'what I discovered on my ravels', I chose the two ponies slide and animated to reveal the distant horse. I used a landscape cloud photo (in portrait mode) for the 'loads of other stuff' but it was visually clunky. For ambient background sound, I made three recordings from the woodland. They were acceptable, but not as vibrant as the two music choices (from the free youtube audio music library). On mixing the voice and music, I made a quick mp3 export, loaded that to Google Drive, sent it to three friends. Two of them came back in five minutes to tell me music is to loud. I changed that straight away. For those who know me, I edit with Sony Vegas Movie Studio Platinum 13.0 on win10. 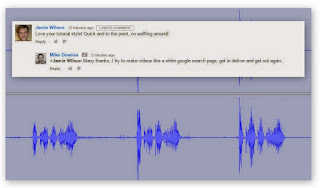 I use the free Audacity 2.1.2 to edit audio and for photos: Picasa, Photoshop and Nik Collection. In this edit, I used four video tracks and three audio tracks. From the slide, you can see how it's laid out. For me, there's a lot of mushy mosaics in action here, some simple math like geometry and a lot of feeling and intuition.All I can say is, you get a feeling you doing OK when you keep playing it back. I always work from 0.00 onwards, a bit like stepson a pavement, stepping stones if you will.. I've made a few channel trailers before, but nothing as elaborately simple as this. My aim, to get past 1,000 Subs and then get past 10,000 Subs. The irony being, after 10k subs I can get access to the London YouTube Creator Space. My argument being if I can get to 10k on my own, then why would I need to access the Space? And even if I do, my location is the fields and the countryside not a London Studio -- that said they do let you borrow cool equipment I believe. You can learn about the creator benefit levels here. I'm a YouTube Partner (like many people these days) where I've had the odd success like an Audacity help video with 58k views or a news video that saw 25k views in a day. As I receive a very modest revenue stream from YouTube it's always been on my list to up my game, increase my video production and see where it will go. This will not make me a better creator unless I try stuff out. But as I help people in forums and make educational videos too, at least I know a few more answers or where to go looking if someone asks. 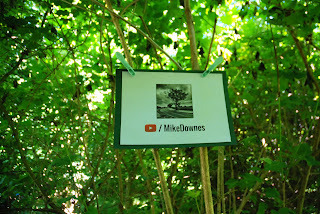 As a Brief History of my channel, it's actually called themikedownespage. I called it a page as I imagined a whole newspaper with my name at the top, something I could add stories, photos and information of what I thought would be useful to people. 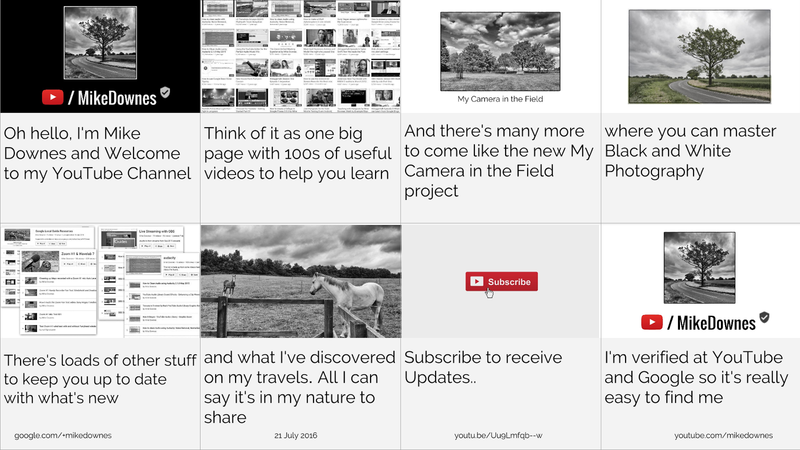 Back on 8 Oct 2010 when I created the channel, I'd not started my blog, hardly tweeted and google plus was not invented. I started with a few videos on firing Halloween Pumpkins out of a Big Cannon. Since then, I've uploaded 510 public videos, 700 in total (most of the private videos have been Google prerelease software tests). Video has never been my top priority - rather I've kinda fallen into it. So there you have it - how I made my trailer. look out for future videos and subscribe if you are interested. By the way, I have a video planned on how I met those adorable ponies - look out for that.